Convenience, price, and packaging have become the driving forces behind the American diet. But what is the true cost of our day-to-day food choices? 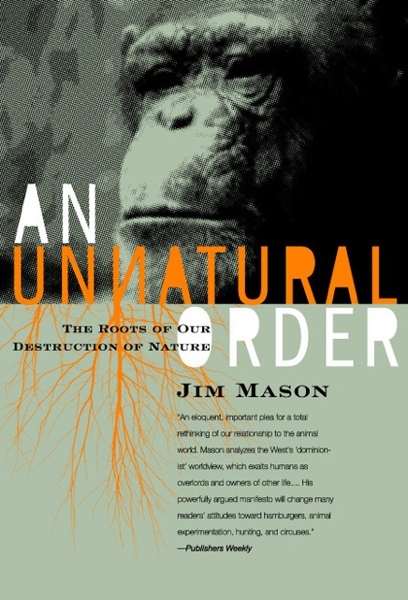 To answer this timely and important question, coauthors Peter Singer, or most probing ethicist, and Jim Mason, an environmentally conscious writer and attorney, undertake a modern-day odyssey both shocking and illuminating. Beginning their adventure at the dinner tables of three typical families with differing tastes and grocery-shopping habits, they set out to trace the origins of the foods we eat. Singer and Mason pursue the story with the kind of investigative and intellectual tenacity behind such landmark titles as Silent Spring and Fast Food Nation, hauling in pots from the Chesapeake Bay with a commercial crabber and dumpster-diving with an urban band of “freegans.” Along the way they check the validity of such labels as “Animal Care Certified,” “Certified Humane,” “organic,” and “Fair Trade.” They expose the working conditions in Southern food-processing plants as well as in other countries. They weigh the pros and cons of buying local, the complex dynamics of sustainability, the controversy over genetically modified organisms, the ethics of obesity, and the health implications of raising children vegan. 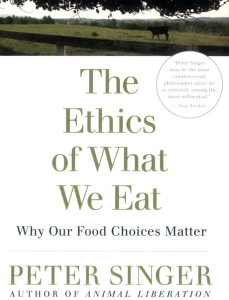 The Ethics of What We Eat concludes with five simple principles that consumers can use to make better food choices. Should we eat meat? If so, what kinds of meat are most humane to eat? What kinds of produce and dairy products? Wild fish, or farmed? Veal — ever? Recognizing that not all of us will become vegetarians, Singer and Mason offer powerful reasons for eating more conscientiously. 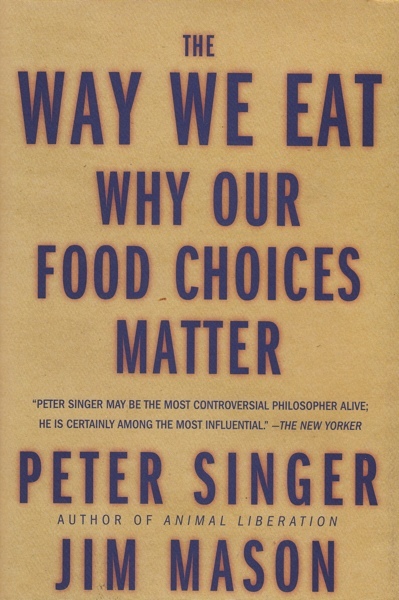 After many years of correspondence back and forth, Peter Singer and I once again found ourselves at the same place at the same time — at the Animal Rights 2001 conference in Washington, D.C. Over several days, we sat together and discussed the history of our collaboration on Animal Factories. Peter suggested that we renew our writing partnership with a new book on the same subject. We went home and continued the conversation in emails and phone calls. At first, we considered a rewrite and update of Animal Factories, but rather quickly concluded that we couldn’t get the same kind of access to factory farms that we had back in the late 1970s. 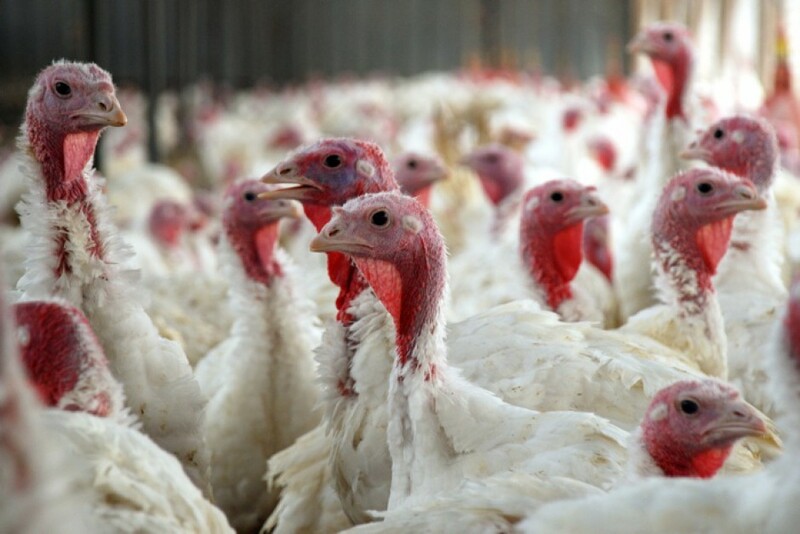 Today’s factory farms operators, having faced decades of critics and bad press, are on the defensive and have — as we would soon find out — closed ranks and slammed doors to inquiring reporters. 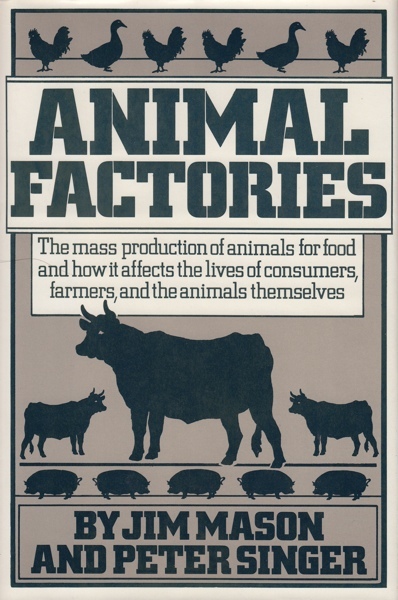 Peter thought that our focus on factory farms had effectively made its case, that the word was out now in the mainstream media, and that we should enlarge the scope of the book beyond industrial animal agriculture. We began to discuss covering the broader range of modern farming and food production and the major ethical concerns presented. Now the question became: what kind of a book? How to make such material interesting? As the author of many books, Peter knows how to compose a book and then how to pitch the idea to a publisher. 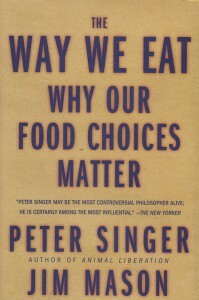 He suggested that we look at the way Americans eat, note their food choices, and trace some examples back to the farm. We would follow those foods from farm to the families’ plates and discuss the ethical concerns raised along the way. We decided to look for families whose food choices reflected a range of ethical concerns: from very strict to very little. We chose three diets: vegan, conscientious carnivore, and standard American diet. We pitched the idea to publishers, and Rodale bought it in February 2003. Now we set out to find families who would be willing to endure months of sharing information with us. We contacted friends, neighbors and relatives and asked them to ask friends, neighbors and relatives who might want to join our project. This produced an initial list of about 20 families across the country; but after a few months of doing their “homework,” only about five or six families maintained commitment. We settled on three and began cataloging their food choices. We asked them to keep a record of what they bought, whether at a supermarket, grocer, farm, restaurant, or take-out. We went shopping with them and took notes; we ate meals with them and took notes. For each family, we made a listing of each food item and its producer or manufacturer. We wrote to each farm or firm — some 80 in all, described our project, and asked them to work with us in tracing the food items according to our plan. Most never responded — even after a second letter. We got a few hostile replies — from the big labels and names in fast food chains. Some of the phone follow-up work brought interesting conversations. One of our families bought Oscar Meyer bacon. I called headquarters (a division of Kraft Foods) and eventually got someone in public relations. I told her about the project, the three families, and said that one family enjoyed the company’s bacon. I said that we would like to see where it came from — the pigs and the farm of a typical supplier. She hesitated, saying that this was an unusual request and that she would have to talk to someone and get back to me. Several days later, she called again to tell me that “information about our procurement and processing of our product is considered proprietary in nature” and referred me to “a great source,” the American Meat Institute, a meat industry trade association based in — where else? — Washington, D.C.
And so it went with the big names in farming and food. We did manage to visit some farms — mostly of the kind that cater to the more ethical consumers, those who buy organic, free-range and the like. One big name broke ranks and called us: Chipotle, the fast-food chain that specializes in fresh ingredients and “food with integrity,” which, according to founder Steve Ells, means knowing “how the vegetables are grown, how the pigs and chickens are raised.” A vividly memorable visit was to Smith Island in the Chesapeake Bay, where I went out early one cold, windy morning with to haul crab pots with Eddie Evans and his son, the 12th and 13th generation of “watermen” on that island. 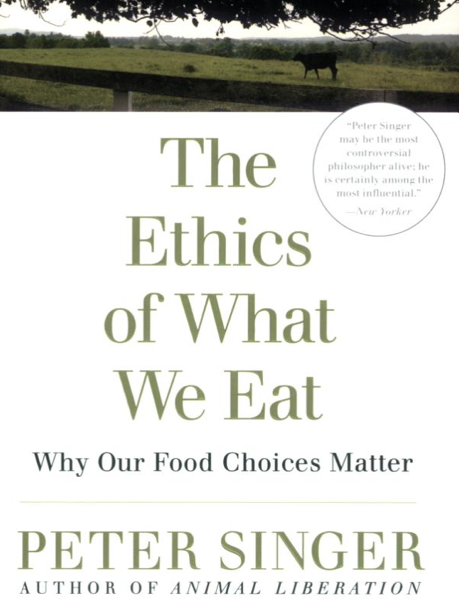 The Ethics of What We Eat was a Top Ten bestseller in Australia and is published in the United Kingdom, Spain, Italy, Brazil, Portugal, and South Korea. It is also published in Spain in the Catalan language and is in press in France. More than 40 percent of the food grown in the United States is lost or thrown away — that’s about $100 billion of wasted food a year. At least half of this food … could have been safely consumed. Our love for fish is wiping many of them out. World consumption of fish and fishery products has more than tripled since 1960. A quarter of the world’s commercially important ocean fish populations are depleted or slowly recovering from past over-exploitation; another 47 percent are fished to the full extent of their capacity. Some people think that factory farming is necessary to feed the growing population of our planet. The truth, however, is the reverse. Far from increasing the total amount of food available for human consumption, it reduces it. Making better food choices doesn’t require hours spent reading labels or rigid adherence to any particular diet. All it takes is the information we provide in this book, which we hope will bring a little more awareness about the significance of the food choices we all make. “It’s going to get better,” [Mary Ann] says, “There some sort of a circle to it. As more consumers get aware, they make demands and create new markets. Then more companies get interested and are willing to invest in these alternatives. Then consumers have more options available to them. Once we found out what our three families ate, we wrote to 87 corporations who had manufactured at least one product that a family had bought. We informed each corporation of our project and asked for their assistance in identifying and facilitating our visits to the farm or facility from which the product came. Few companies bothered to reply. So we sent follow-up letters, adding that we were keen to get the producers’ side of the story. After all this, only 14 companies indicated that they were willing to assist us in any way. Most of these companies were relatively small producers of organic foods. Factory farming spread because it seemed to be cheaper than more traditional forms of farming. We have seen that it was cheaper to the consumer, but only because it was passing some of its costs on to others. Jake thought that she was buying milk from local farms because Coleman Dairy … is an Arkansas-based corporation. When we called and asked if we could see their cows, however, Walt Coleman told us that they hadn’t had any cows since 1935. They buy their milk from Dairy Farmers of America, a big dairy cooperative. Coleman wasn’t willing to help us any further in our quest to see the source of Jake’s milk. If the Norwegian salmon filets Mary Ann bought from Horizon came from Norway, they were almost certainly from fish farms. Wild Atlantic salmon has largely gone the way of the cod. So few survive that 300 farmed fish are sold for every one that was caught swimming freely. A British study calculated that the ingredients for a single meal, consisting of chicken from Thailand, runner beans from Zambia, carrots from Spain, snowpeas from Zimbabwe, and potatoes from Italy, could have traveled a total of 24,364 miles. A similar meal could have been made with ingredients traveling only 376 miles, if domestically produce ingredients were used and seasonal vegetables … had been substituted. Plantations and factories can use the fair-trade label if employers pay their workers decent wages, comply with health, safety, and environmental standards, allow workers to join unions or other forms of associations, provide good housing if workers are not living at home, and do not use child labor or forced labor. Organic food costs more partly because, as we have seen throughout this book, intensive industrial agriculture leaves others to pay the hidden costs of cheap production — the neighbors who can no longer enjoy being outside in their yard; the children who cannot safely swim in local streams,; the farm workers who get ill from the pesticides they apply, the confined animals denied all semblance of a life that is normal and suitable for their species; the fish who die in the polluted streams and coastal waters (and the people who previously caught and ate those fish); and the unknown number of inhabitants of low-lying lands in Bangladesh or Egypt who will be made homeless by rising sea levels caused by global warming. [Scott] Jurek, a vegan, shattered by more than 30 minutes a [Badwater Ultramarathon] course record that some thought unbreakable, finishing a full two hours ahead of his nearest rival. Starting below sea level in Death Valley, he ran 135 miles, some of it in 115-degree heat, to finish over 8,000 feet up on the slopes of Mt. Whitney. Most states with major animal industries have written into their anti-cruelty laws exemptions for “common farming practices.” Effectively, then, cruelty is legal as long as it is done by most farmers, and you can’t prosecute anyone for it. The surest way to avoid harming animals and the environment is to avoid animal products altogether. If you feel that you can’t go all the way, all at once, at least try vegan meals some days each week. You may already be doing this unintentionally if you choose some of the offerings at Italian, Chinese, Middle Eastern, or Indian restaurants. It’s really not that difficult, and you’ll like the food. When we feel overwhelmed, it is important to avoid the mistake of thinking that if you have ethical reason for doing something, you have to do it all the time, no matter what. But this rule-based view isn’t the only possible approach to ethics, nor the best one, in our view. Ethical thinking can be sensitive to circumstances. You can be ethical without being fanatical.